Day 34 - Honestly ... about Posture! Improper posture, especially when walking, puts increased stress on your back and causes discomfort and damage. The key to good back posture is to keep the right amount of curve in your lower back. Medical professionals suggest that a healthy back has three natural front-to-back curves that give the spine an "S" shape. Although there is much natural variation from person to person, too much curve (swayback) or too little curve (flat back) can result in problems. The right amount of curve is called the neutral position. About 99% of people are not aware of how important it is to do every exercise in the correct posture to have the desired effect. Importance needs to be emphasized from the moment one decides to start their fitness regime. Due to a bad posture one can end up spending double the amount of time that might have required getting the 'result.' To attain the right posture comes with practice and can sometimes take years. Initially, one might even find it painful to correct their posture. But that is only due to the lifetime spent in crocked body positions (sitting/standing/moving). • Always have your back straight. Imagine you are trying to hold a pencil between your shoulder blades. • Chest up and out, belly always tucked in. • Neck should always be held perpendicular to your shoulders. • Your weight should be evenly distributed on both your feet. 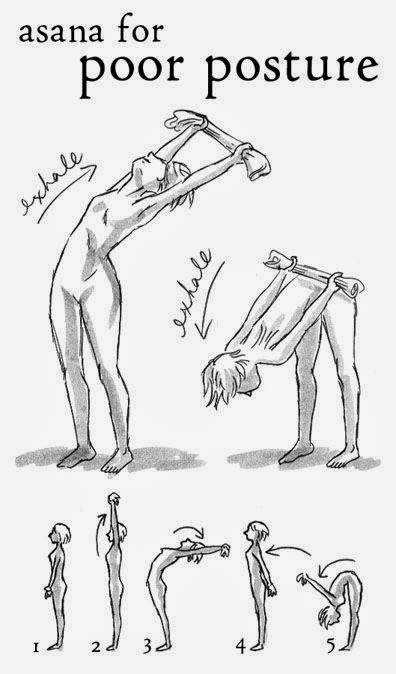 It sounds much easier than it actually is but it is immensely important for a healthy and flexible body. The side effect of a good posture will be 100% impact of any exercise you do. So, in the previous post, I didn't actually complete my thought on ... honesty. Besides, not being able to lie or be diplomatic (successfully) and hence choosing silence over empty conversations, I yet, believe strongly in the power of honesty. A lot of times it's not about what you say, but how you say it (and whom you say it to, sometimes :P). I am from Hospitality Industry, and contrary to what everyone might like to believe, life in hotels & restaurants is not smooth or of top-notch-standards 24/7. Things go wrong all the time (linen doesn't arrive on time, staff is late, things breakdown, dishes get burnt). But I learnt early on in my career that if I explain honestly to the guest about what the problem was instead of cooking stories, the conversation will be much shorter and more amicable. I also had similar experience at job interviews. If I lacked in any area I honestly accepted it and that showed me in positive and earnest light (worked in my favor!). Plus, I escaped from the burden of remembering all the lies I might have cooked up. I think, in today's times we give very little weightiness to how much gravity honesty holds ... Think about it! You have brought a very important point in focus baby. Posture is definitely equivalent to the quality of results that someone sees after their workout. A lot of times people try to lift weights that are too heavy. This in turn results in wrong postures. In my experience, if you cannot do 8 reps of a first set with a particular weight than it is too heavy for you. And if you can do more than 14 then it's too light. In one of your future posts may be you can also tell us about the different routines involved in muscle toning vs muscle building exercises. Husband - Good point. I shall definitely try to cover that in one of my future posts. Thank you for your kind words, always :o) Kiss! Thanks! That I'll keep in my mind for my next class. So let's say in the fitness world, we would call it: "Posture, Posture, Posture"! I feel a very important part of honesty, is "not fearing" also. But I strongly believe that hell may break loose, it's very important to start and grow a marriage strictly on HONESTY. Honesty is transparency and baring of the soul and if you do want to make your partner your soul mate, then you must be ready to get 'naked'! Ani - Yes, be careful with the posture else you will hurt yourself. About honesty ... you are correct ... fearlessness is the first step. Just have to know the difference between courage and craziness at all time.